No one will be turned away due to financial hardship. Please register online. Orgonomy is the scientific study of life energy, called “orgone energy,” by the Austrian physician, Wilhelm Reich. If you have never heard of Reich’s scientific study of life energy this is not surprising, as his books were burned by the United States Government, and the standard narrative is that he was early on a brilliant psychoanalyst who later went “off the rails,” and therefore his work doesn’t merit serious study. Our orgonomy conference in 2015 is designed to offer a corrective to this often repeated viewpoint, to give the participant good reasons to study Reich seriously. Welcoming: An introduction to the IOS, the speakers, the format of the day. 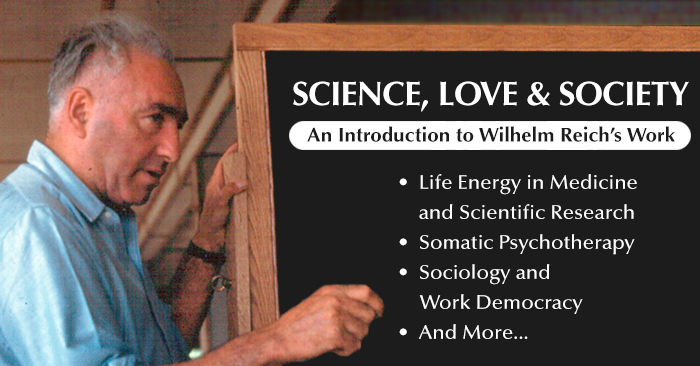 Who was Wilhelm Reich and what is Orgonomy? An Overview. What is Psychiatric Orgone Therapy? Wilhelm Reich’s Social and Political Insights. Orgone Energy: Theoretical and Practical Implications. Round table discussion: Current and past misrepresentations of Reich’s life and work and its influence on the current teaching of orgonomy. Philip W. Bennett has a PhD in philosophy from New York University. He has published a number of articles about aspects of Reich’s life, including recent ones in The International Journal of Psychoanalysis and Psychoanalysis and History. He has lectured about Reich here in Philadelphia, in New York City, at the Reich Museum center in Maine, and in Germany, Austria, Norway, Denmark, Italy, Mexico, and most recently in Finland. When not traveling and lecturing, he continues to work on his book, From Communism to Work Democracy: the Development of Wilhelm Reich’s Social and Political Thought. Hugh Brenner was born into the Orgonomic Infant Research Center. He started Nursing School in 1980 and spent over 15 years working in various psychiatric settings. In 1994 he graduated from the University of Pennsylvania School of Nursing with a MSN in Child and Adolescent Psychiatric Nursing and soon started a private practice, combining traditional psychiatric modalities with psychiatric orgone therapy. In 2010 he graduated from Rutgers University with a post-graduate certificate as a Family Nurse Practitioner. He holds three Board Certifications. He has been involved in The Institute for Orgonomic Science for 15 years and is the current President. Dr. Morton Herskowitz, DO, graduated Temple University in with a BA in 1938. He attained his D.O. from the Philadelphia College of Osteopathic Medicine in 1943. After his internship at Harbor Hospital in Brooklyn, NY he worked as a General Practitioner for 3 years. In 1945 he began formal supervision in psychiatry. He began his personal therapy and training with Wilhelm Reich, MD in 1947, continuing until Dr. Reich imprisonment. Board Certified in Psychiatry, Dr. Herskowitz has been practicing psychiatric orgone therapy for more than 60 years. Currently he has a practice consistent with his age and energy. He is the author of the book Emotional Armoring: An Introduction to Psychiatric Orgone Therapy. Since 2002, Kevin Hinchey has been one of the directors of the Wilhelm Reich Infant Trust which administers Reich’s archives at the Countway Library of Medicine at Harvard University; works with New York publisher Farrar, Straus & Giroux to publish Reich’s books; and operates the Wilhelm Reich Museum in Rangeley, Maine. He has an M.F.A. in Film from the New York University Graduate Film School and over the past ten years has been a film professor in Connecticut and Massachusetts. Mr. Hinchey is now involved in the production of a full-length documentary on the life and work of Wilhelm Reich with location filming and on-camera interviews in the United States and Europe. Harry Lewis is an orgone therapist in private practice and the co-director of The Institute for the Study of the Work of Wilhelm Reich. He has been a member of the faculty at the New School for Social Research for the past twenty-six years. Click on “More Options” on the map above, then type your location on the “starting point” field. Closest lodging is the Sheraton University City, Philadelphia 19104. OR go to this link to find prices for all local parking.